Telephoning and messaging communication skills in businesses and offices are perhaps more important than ever before. There are many common expressions that students can learn to help them gain telephoning skills fluency . This is a fun introductory exercise for English language learners that helps them become familiar with telephoning expressions and vocabulary. Click on the image or the link to download the PDF file. 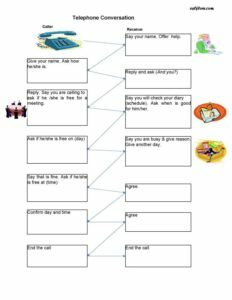 This is a telephoning exercise for English language learners to practice using elementary language necessary for simple telephone calls. Students complete the speech bubbles with appropriate language and expressions. 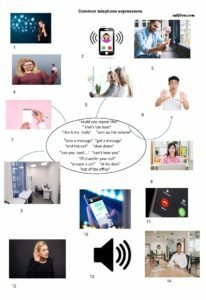 Another telephoning exercise for English language learners to practice using elementary language necessary for business socializing and making phone calls. Students complete the speech bubbles with appropriate language and expressions. 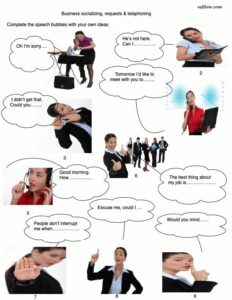 This is a dialogue or role play exercise for students s to practice creating complete telephone conversations . Students use the cues in the boxes to write appropriate conversations.